← What kinds of hand injuries are more likely to result in amputation? Scott Taylor and Emma Bell, members of the editorial boards of SAGE published journals International Small Business Journal and Organization, recently returned from a one-day workshop on ‘Publishing in International Management Studies Journals’. It was hosted by Professor Singh Sengupta at the Faculty of Management Studies at the University of Delhi. The workshop was attended by 58 participants all of whom were either established Faculty working in Indian business schools or currently registered PhD students. The event familiarized participants with all aspects of journal reviewing, critical, theoretical writing and publishing from initial submission to final publication. It was led by Dr Emma Bell and Dr Scott Taylor, both from University of Exeter, whose visits were funded by UKIERI and a University of Exeter Outward Mobility Fellowship. Participants were briefed on how to prepare their work to satisfy publishers’ and journal editors’ expectations by invited guest speaker Ms Payal Kumar, Vice President Editorial & Production at SAGE India. Prior to the workshop, data was collected on participants’ prior publishing experience, their publishing goals and areas of research expertise. Business school subject areas represented included: organizational behaviour, HRM, economics, finance, marketing, strategic management, business ethics, leadership and innovation. 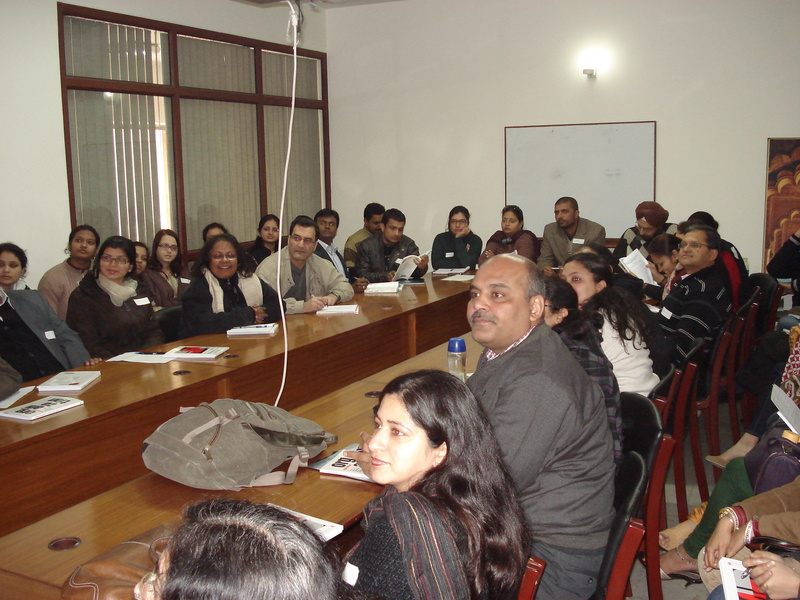 This work was conducted with a view to forming communities of research practice between researchers in India and enabling the ongoing support of participants by the workshop organizers. Questionnaire feedback collected from the event was overwhelmingly positive, with participants typically expressing the view that the workshop was ‘informative’, ‘encouraging’, ‘well organized’, ‘timely’, ‘useful for scholars at all levels’, an ‘excellent networking opportunity’, and ‘should be run again, possibly in a longer or more discipline-specific format’. The workshop organizers have already received more than five invitations to repeat the event at selected business schools in India. Do you hold regional events to support researchers in gaining new skills? Why not take a look at the tools SAGE currently offers in our journal author gateway? Tell us what else you’d like to see in this resource centre as we value your feedback. This entry was posted in aaa DO NOT USE, SAGE Connection and tagged early career researchers, getting published, journals publishing, Management. Bookmark the permalink.